For 250 years, Guinness has been been at the forefront of successful Irish branding. We take a look at how the company used advertising in print and on television to spread the word of the black stuff. GUINNESS IS GOOD for you, or so they say. Now, whether that is true or not, one thing is without doubt: Guinness ads are always good. In fact, some have even called them genius, so we’ve decided to take a look at the evolution of Guinness advertising over the past 250 years. Guinness was founded in 1759 but didn’t publish its first ad until 1794, and it soon set the standard for beer advertising with witty, engaging ads that helped create arguably the best-known beer worldwide. Let’s take a look at how Guinness ruled the airwaves before moving on to its print advertising below – don’t forget to let us know in the comments which Guinness ad is your favourite. 1970: Ad agency JWT wins a Cannes Grand Prix for Black Pot. 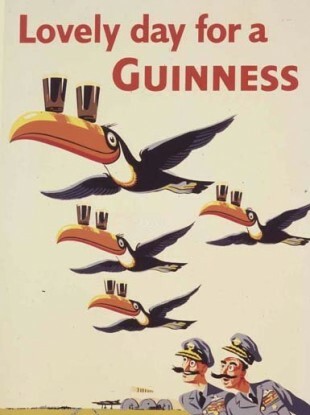 Before there was television, there was print advertising – and Guinness knew just how to grab the attention of viewers, thanks to its eye-catching images and memorable slogans. Email “250 years of genius: The evolution of Guinness advertising”. Feedback on “250 years of genius: The evolution of Guinness advertising”.